Let’s follow that adage and see where it takes us. What information do I need to do my job? from whom should I be getting it? what new tasks can I tackle now that I get all these data? which tasks should I do differently? what information do I owe? Before we return to those focusing directives, here’s a few words regarding what this scribbles ‘n bits weblog is about. Said another way (and getting back to Drucker’s questions), this weblog is largely about the getting and giving of task-related information. With a special interest in the FORMS the task-related information takes. 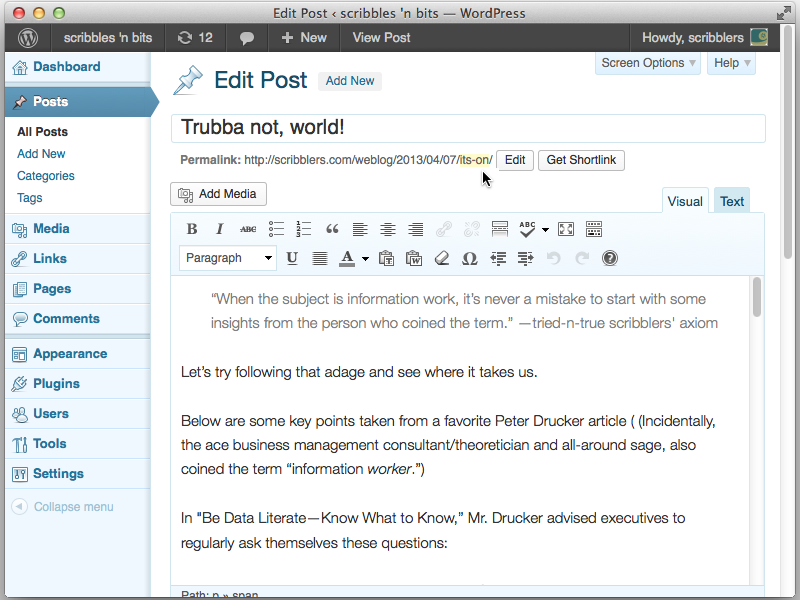 To get a sense of upcoming scribbles ’n bits blog posts, check out some scribblers.com workshop archive pages. Look for stuff mentioned under “workshop highlights” and “more workshop takeaways” (e.g., that Michael Kinsley comment on the then-new blogging phenomenon; two highly recommended sources for training and exercising information design skills). And as you may have already figured, repackaging, repurposing, and reworking content is itself a recurring meme here. Goodness gracious—where are our manners sometimes! Almost forgot: Welcome everyone to Scribbles ’n Bits, the official weblog of Scribblers Media! And, as always, THANKS for your attention!